Hi friends today i will show you how to make vegetable biriyani in cooker.so don't miss it coz here i will describe making veg biriyani step by step. 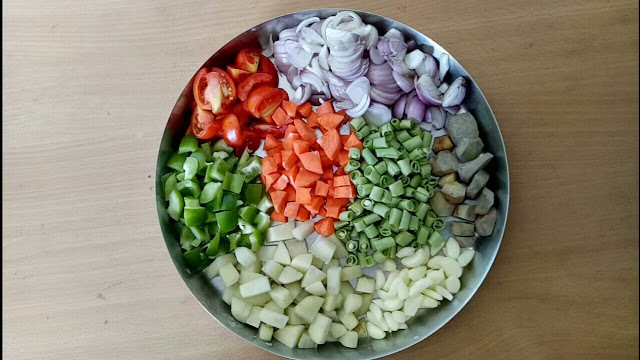 Summer is here and we all know that summer is not the ideal time for eating such type of non-vegs like egg ,mutton ,chicken etc. Also should avoid using extra oil in cooking. Fruits, green vegetables,lite soups ,salads, curd rice, wheat chapati or atta bread is ideal for daily diet. 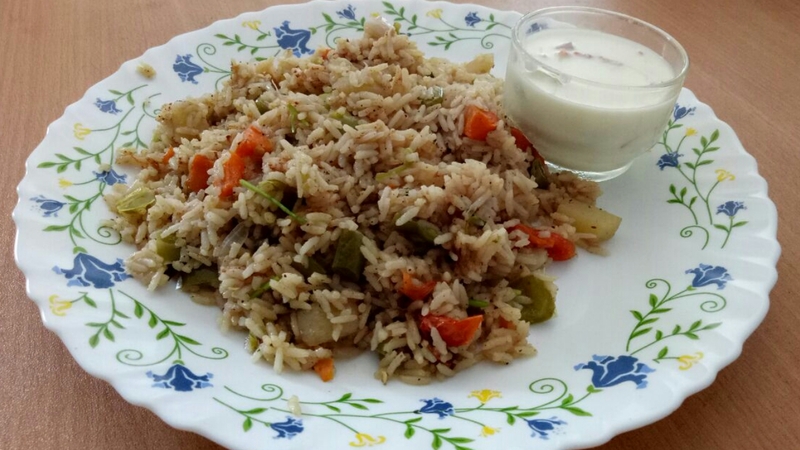 But sometimes we are getting bored to use this type of recipe in our daily diet. So ,I want to share a very common and delicious recipe with all of you in this blog which is not only tasty also is very healthy , which can keep your body cool ,maintain your body temperature and had a number of health and nutrition benifits . 1. Basmati rice /regular rice -1 cup washed and soked in two cups of water. 4.Onion - 2 medium size, slices . 5.Tomato -1 medium size ,cut into cubes. 6.Carrot - 1 small size, cut into small cube size as like potato. 10. Well chopped coriander leaves. 11. Well chopped mint leaves. 12. Ginger garlic paste - 2 spoon. 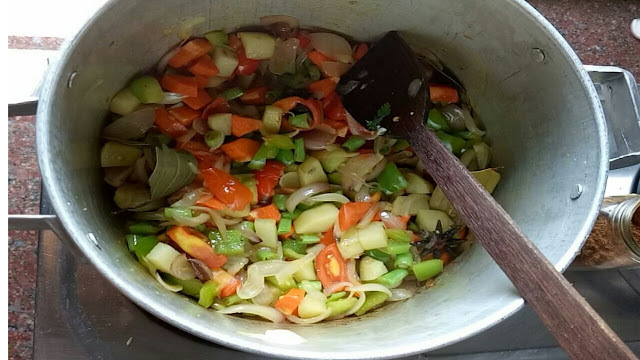 Take a cooker or any other medium size pan , turn on the gass flame.After heating thecooker,take oil or ghee into the cooker and within 2-3 minutes add the whole spices (bay leaf, cardamon, cinnamon,clove). After that add potato ,carrot saute it for 3 minutes, and add tomato, bines green bell paper ,green chilli mix all the ingridient very well and cover the pan for 2minutes. After 2 minutes open the lid and add ginger garlic paste ,biriyani masala powder , garam madala powder, and have to mix all. After 5 minutes when all the vagitables and spices begin to spread flavor have to add the soked rice and cooked all together for few minutes. 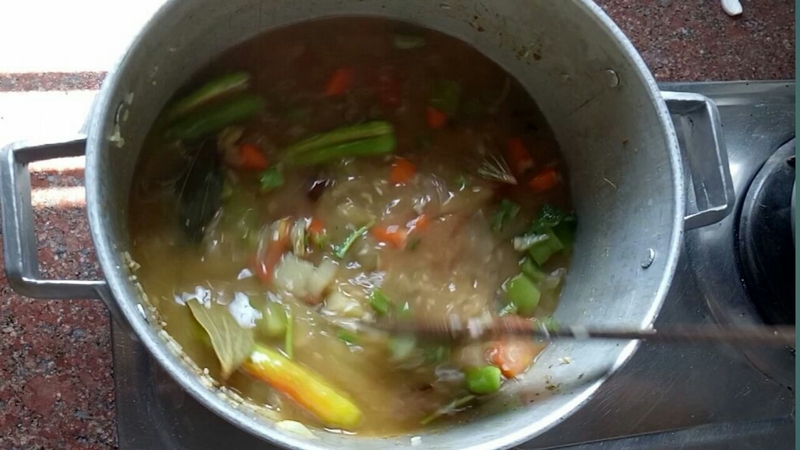 Then add the extra rice soked water ,wait 5 minutes for boiling . 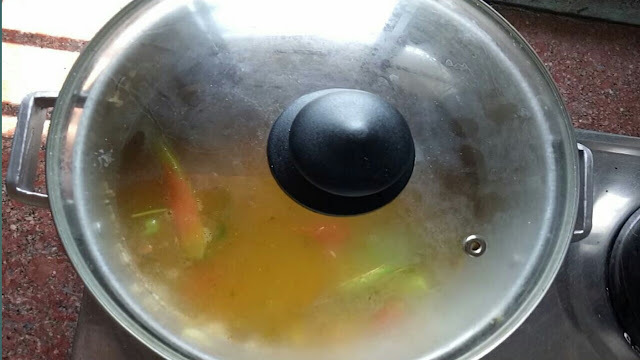 #Then add mint and coriander leaves, cover the pan/cooker with a lid and check the recipe within few minutes . Cooked it for 7 to 8 minutes and you can see all the extra water is soked by the rice, off the gass flame and cover it for 10 minutes . After 10 minutes it's ready to serve with a wonderful raita to. 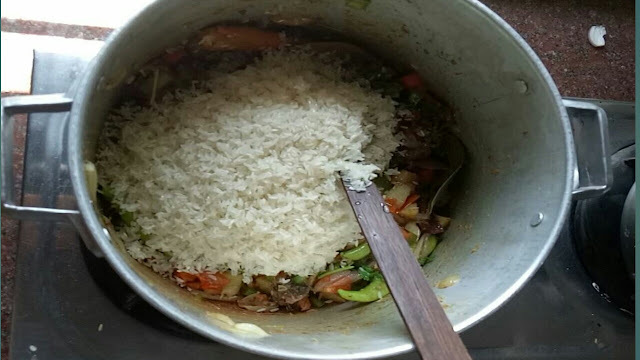 If you like the recipe please comment and share with your friends ,family so they can also know about wonderful veg recipe for the summer season, which is easy to make and delicious to eat also with full of nutrition value. This is a good article about Biriyani, next time I will try this to make, but one suggestion go for wordpress and of course get good hosting like virmach, which will really help you to grow.